Due to the amazing audio quality – high speed download time (20-30min). 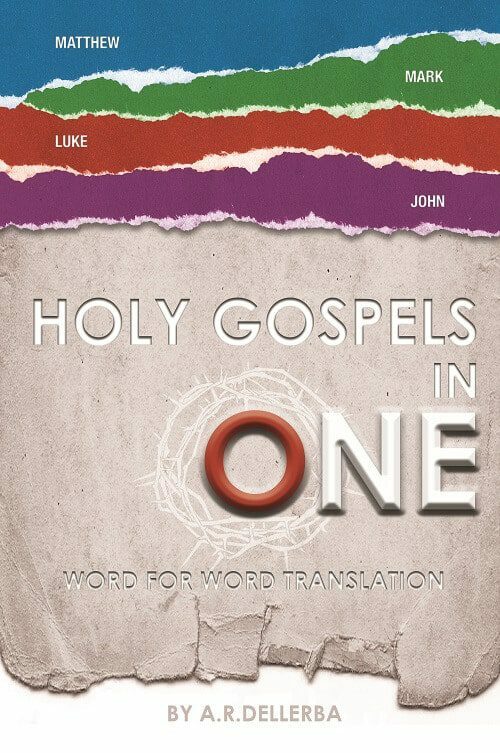 Holy Gospels in One is a word for word English translation of Matthew, Mark, Luke and John into a single chronological narrative. Each Greek word from the Greek Received Text is translated into English and diligently sequenced into one Gospel narrative. Thereby dispelling “so-called” Gospel contradictions and empowering Bible scholars to analyse scripture across the Gospels with ease. Leading to a dynamic and enriched Bible study experience. he Greek Source Text for the Holy Gospels in One narrative was Stephanus AD 1550 Received Text. Specific attention was made to textual translation accuracy by comparing the translation to the King James Version AD 1769, while cross referencing the below sources. Translations based on Greek Byzantine and Received Texts: Tyndale, Sir J Green’s Greek Interlinear. Translation based on the Peshito Aramaic Text: James Murdock. Translations based on the Peshitta Aramaic Text: Interlinear Younan Translation and Interlinear George Lamsa. Translation of the Gospels based on the Latin Vulgate by Jerome: Wycliffe. For tenses and plurality, the following were used: Robinson’s Morphological Analysis Codes of Stephanus AD 1550, with variants of Scrivener AD 1894 Received Text. For definitions: Strong’s Aramaic & Greek lexicons, the Complete Word Study Dictionary and Thayer’s Greek definitions. For city and town locations: 1st Century Maps and Charts were uniquely compiled, where some credible sources differ on cities and towns, then writers from the first four centuries (incl. Flavius Josephus) and the latest archaeological discoveries were used to determine the most probable location. 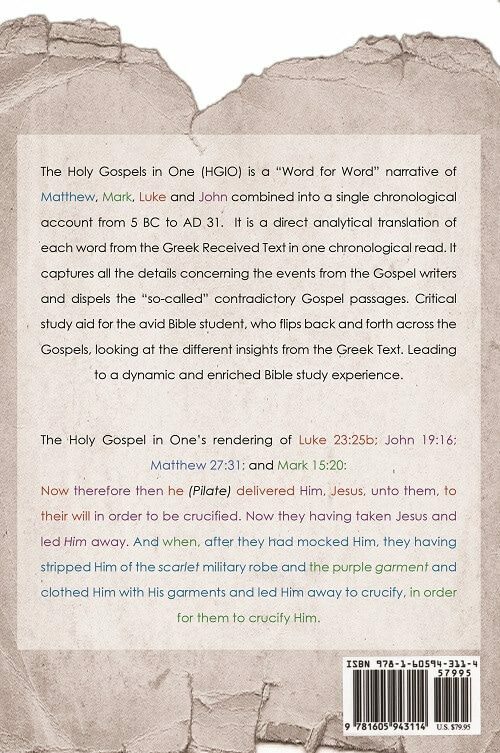 Holy Gospels in One narrative reads: Now therefore then he (Pilate) delivered Him, Jesus, unto them, to their will in order to be crucified. Now they having taken Jesus and led Him away. And when, after they had mocked Him, they having stripped Him of the scarlet military robe and the purple garment and clothed Him with His garments and led Him away to crucify, in order for them to crucify Him. The Greek Source Text for the Holy Gospels in One narrative was Stephanus AD 1550 Received Text. About the Author: Christian, father, son, brother and a member of Mensa, who has spent over 5 years compiling this narrative.